Shell has always been willing to deal with dictators including Adolf Hitler, Muammar Gaddafi and General Sani Abacha. Profits first, ethics last. Shell remains willing to deal with the devil. I note that nearly a year after the departure of Peter Voser as Shell CEO, it is his signature that is still displayed on Shell’s Business Principles. That tells us all we need it know about the priority and importance that Shell attaches to its claimed ethical code. 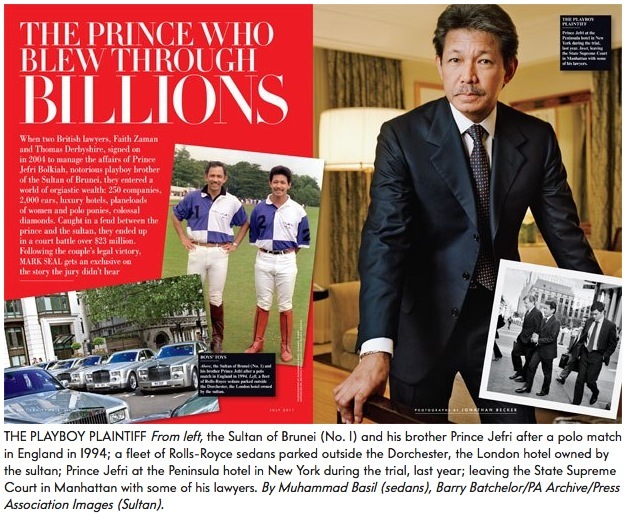 BANDAR SERI BEGAWAN: His Majesty Sultan Haji Hassanal Bolkiah Mu’izzaddin Waddaulah, the Sultan and Yang Di-Pertuan of Brunei Darussalam consented to receive in audience the Chief Executive Officer of Royal Dutch Shell, Mr Ben Van Beurden, ©BRUDIRECT.COM reported. The audience ceremony took place yesterday at Istana Nurul Iman. Present during the audience were the Second Minister of Foreign Affairs and Trade, Yang Berhormat Pehin Orang Kaya Pekerma Dewa Dato Seri Setia Awg Lim Jock Seng who is also Chairman of Brunei Shell Joint Venture Companies and the Minister of Energy at the Prime Minister’s Office, Yang Berhormat Pehin Datu Singamenteri Colonel (Rtd) Dato Seri Setia Dr. Awg Haji Mohd Yasmin bin Haji Umar. Also present were the Permanent Secretary Downstream & Power at Energy Department, Prime Minister’s Office, Dato Paduka Haji Jamain bin Haji Julaihi, Executive Vice President Joint Ventures Royal Dutch Shell, Mr De Ray Venter and the Managing Director of Brunei Shell Petroleum Company Sendirian Berhad, Mr Ken Marnoch. Posted in: Adolf Hitler, Ben van Beurden, Bribery, Brunei, Business Principles, Corruption, GoogleNews, Human Rights, John Donovan, Royal Dutch Shell Plc, Shell.